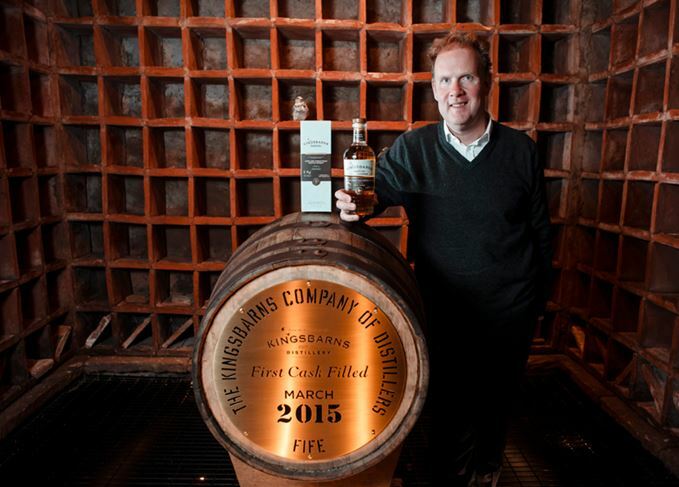 William Wemyss is managing director of Wemyss Vintage Malts and Kingsbarns distillery, which recently launched its first official whisky, Dream to Dram. He talks to Dave Broom about the new member of the family business, wine, tea, handshake deals and the family’s long history in Fife. ‘It is nice to be able to give back something to Fife, as the family has lived here since the 12th century. My cousin Michael is either the 46th or 47th generation to live on the estate. ‘We were coal miners [more accurately they owned coal mines] until they were nationalised, and we have various other businesses [including property, wine and renewables, as well as Wemyss Vintage Malts] within the family group. Yet Fife was a natural place for us to own a distillery. ‘There wasn’t any history of distillation in the family, other than Cameronbridge distillery being built on family land [in 1824]. My father and grandfather were growing barley and grain for local distillers, and we still use our estate-grown barley for Kingsbarns. ‘He explained that because of the long-term nature of the industry, everyone is very friendly, and it is true. Everyone by and large helps everybody else; the big boys help minnows like ourselves. From a work perspective, it’s a very refreshing approach. ‘It was a natural evolution for us to become a distillery owner. It was already a well-trodden path with Andrew Symington [Signatory] and Lenny Russell. The timing was right for us. ‘Doug Clement [who had initiated the idea of a distillery at Kingsbarns in 2009] sent me an email about the concept, which I was stupid enough to open and read just as I was on my way to Haymarket railway station. I thought the project was interesting. I told him that we were looking to build a distillery and we began discussing it in 2012. ‘We were independent bottlers and had experience in selecting casks, blending, bottling and marketing. Adding on production was the next challenge. The involvement of Jim Swan was key. We couldn’t afford to wait 10 or 15 years before releasing a whisky. ‘It becomes a very expensive business, so Jim was instrumental in ensuring that we could release a whisky in three or four years, but also that it would go on maturing. We have a production plan that stretches across 21 years. ‘Rimauresq is very keen for us to do maturation and finishing with their casks, but that’s probably more of a Wemyss Vintage Malts project. Since Kingsbarns is all first-fill and we’re spending good money on them, it’s probably not the most sensible thing to go and change flavour by doing finishes. Who knows in years to come, though? ‘We still own tea estates in Kenya, but it’s for blends rather than being the tea equivalent of a single malt. We don’t make our own tea bags. That said, there are links. Our estates are at an elevation of around 6,000 feet, which reduces yield and improves quality, so there is potentially a similarity there. It might also be something for a new generation to investigate – it won’t be me, I’ll stick to whisky and gin. ‘I think there’s 18 distilleries either in production or pencilled in for Fife – and there’s now a Fife whisky festival – so things are changing fast. I don’t know whether Fife will ever get GI status, but I think Eden Mill, Daftmill, InchDairnie, Lindores and ourselves are changing the landscape hugely. ‘We wanted to use local ingredients as much as we could, so to have all the barley grown on the family estate was important. Having maturation done here as well was all part of the same idea of provenance. From the other end, we are Fifers and we want to support the local economy as much as we can, because we have been here for a while and it would be a good thing to do.